High-speed internet service provider BSNL has announced the launch of two new Unlimited Broadband plans under FTTH services at 20Mbps speed. 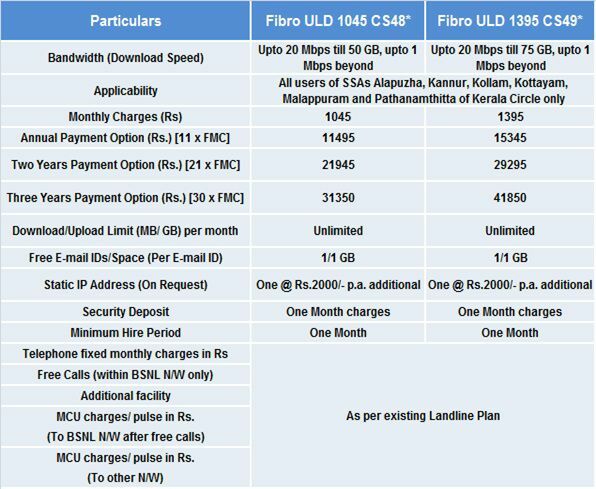 State run Telecom Company Bharat Sanchar Nigam Limited (BSNL) introduces 20Mbps speed Unlimited Fiber Broadband plans ‘Fibro ULD 1045 CS48’ and ‘Fibro ULD 1395 CS49’ across Kerala Telecom circles from 1st June, 2017 onwards. As per latest information, BSNL highest revenue generating Kerala circle has decided to introduce two new Unlimited Broadband plans based on demand for high-speed internet services under FTTH services. However, these new Broadband plans will be available in limited districts of Kerala circle like, Alapuzha, Kannur, Kollam, Kottayam, Malappuram and Pathanamthitta of Kerala State. Under this plan, subscribed user will get 20Mbps speed internet usage upto 50GB / 75GB and beyond the speed will be limited to 1Mbps. BSNL provides Annual, Two years, Three years payment option with discount of FMC charges upto 6 months. However, under these plans additional facility benefits will not be provided for subscribed users. The above new Broadband schemes will be implemented with effect from 1st June, 2017 onwards across Kerala Telecom circle on regular basis. Note: The above plans are already available in districts, Trivendrum, Ernakulam, Thrissur, Palakkad and Calicut of Kerala state.